Jim and Suk Taylor have been a part of the AFBM family since 1991. God has given them a burden to reach out to the men and women who are faithfully serving the nation at Kunsan Air Base (AB), South Korea. 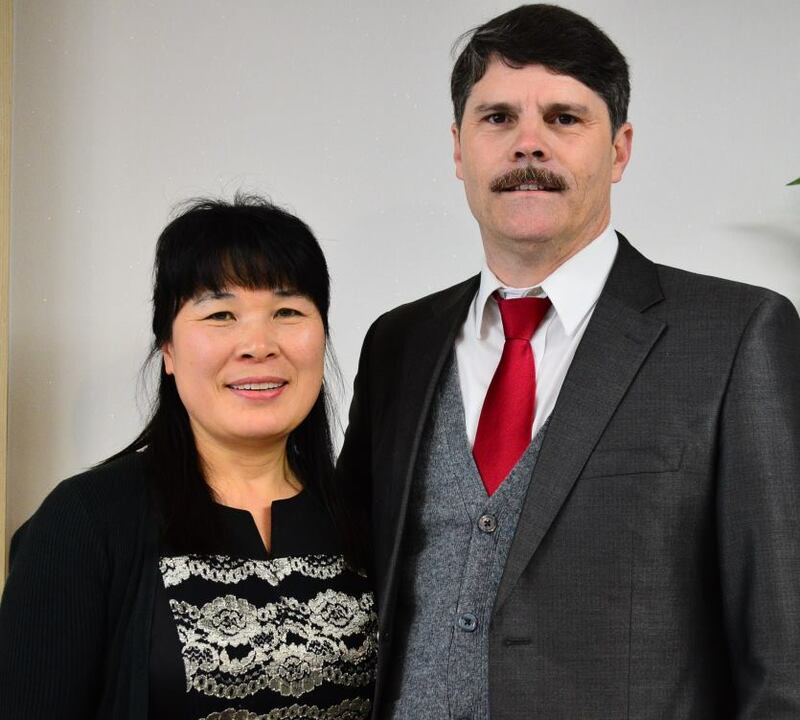 Having served in South Korea as Christians, Jim and Suk developed a special burden for those who are separated from their families on a remote tour at Kunsan AB. Jim realized the necessity of having a place to worship and serve the Lord while stationed abroad. Jim joined the Air Force right out of high school in 1980. As the son of an Army career soldier, he grew up on military installations and was certainly no stranger to military life. But he never really expected to spend most of his career as well as most of his civilian life on the opposite side of the world from his home in northern Virginia. In 1983 Jim was stationed in Kunsan AB, South Korea where he met a dedicated believer who was also a member of a local Independent Baptist church. After months of prayer and witnessing, Jim finally accepted Christ on February 27th, 1984. This was a very important time in Jim’s life because he not only accepted Christ but also married the sweetest young lady in the world. They were married just two weeks before Jim accepted Christ. Suk grew up on a small island not far from the mainland of Korea and came to know Christ as a young teen. Not long after that, she began praying that God would give her a pastor for a husband and God honored her prayers by calling Jim to preach not long after he was saved. For the next 16 years, Jim and Suk would follow Uncle Sam’s orders from Korea to Langley AFB, Virginia and then back to Korea again. In all, Jim spent close to thirteen years of his Air Force career at Kunsan AB, Korea. During all that time, he and his family stayed very active in their church, Haven Baptist Church, where he now serves as the pastor. While Jim was still in the Air Force he joined AFBM as an associate missionary and stayed on as a full-time missionary after he retired in July 2000. During his time in the Air Force, Jim was able to complete his Doctorates in Religious Education and was awarded his degree in 2001. Suk was also able to complete her degree in Christian Education as well. Noticing an extreme lack of Christian education in Korea, Jim and Suk have planted a Christian foreign school for western children, a Christian language institute for Koreans, and a Bible college for training men and women for the ministry. Jim served as assistant pastor under the leadership of Pastor Bill Stewart for 16 years before leaving to start Victory Baptist Church in 2003. In 2012 the Stewarts retired and the two churches merged making Jim the pastor of the Haven Baptist Church, affectionately called “The Haven”. The Haven is primarily a military church in a unique place producing incredible results! Over the years it has produced over 85 pastors, missionaries, Christian educators, or other church staff members. Some have likened it to “Christian Basic Training and Tech School all rolled up into one”! It has been a “home-away-from-home” for our military at Kunsan AB since 1971. The Taylors are sent from Victory Baptist Church in Hampton, Virginia. God calls the men and women of AFBM to serve Him in unique ways. He may also be calling you to a special role in Jim and Suk’s ministry to those who are separated from friends and family at Kunsan AB, South Korea. Would you consider becoming a Ministry Partner with them through prayer and/or financial support. Contact the Taylors for more information and to sign up for prayer letters.